Two New York Cops are suspended without pay after a failed bust. With no income to pay for his daughter's wedding, veteran officer Jimmy Monroe decides to sell a very rare baseball card. Oddly enough, when his baseball card gets stolen, Jimmy and his suspended partner Paul Hodges set out to track down the thief and his valuable card. The two detectives however uncover an entirely new case that could be their ticket back to esteem and praise within the department. Touted as one of the elite scripts from the infamous Hollywood Black List, "Cop Out" was originally titled "A Couple of Dicks" and penned by Robb and Mark Cullen. Warner Brothers later scoffed at the title thinking it was too racy for wide release. The reason I bring any of this up is, I'm wondering how much was changed? Because the final product does not equal all of the initial buzz surrounding the script. The script is nothing new. It is a connect-the-dots police drama with some witty dialogue surrounding it. Both Robb and Mark Cullen were executive producers, so they certainly had a big hand in the film. So what happened? Was the script that good? Having not read the script there is no way to really tell, but I can dissect the film perhaps enough to get a better picture. 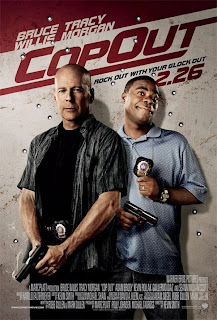 "Cop Out" feels very much like a homage to crime/comedy films that came out of the 1980's. Movies like Beverly Hills Cop, Midnight Run, Fletch or 48 Hours. Simple crime stories that were laced with hijinks and hilarity. If the comedy is not a tribute to this particular genre of film, it treads in dangerously similar waters. By no means do I mean that in a bad way. I love every single one of the movies I referenced above. Their classics, but now days movies are a whole different beast, and moviegoers like myself tend to expect a bit more believability. Moviegoers seem to have shifted from enjoying light-hearted cop movies to hyper-real. Perhaps we can blame television's countless versions of Law & Order and CSI, but the days of Stakeout, Red Heat, Running Scared and Tango & Cash sadly are gone. Granted films like Bad Boys, Rush Hour and Hot Fuzz have worked since, but they come far more rarely. One of the more obvious reasons "Cop Out" does not reach the acclaim it should, is all of the middling it does. The comedy never pushes itself enough in one general direction. It has moments of over-the-top and then it shifts back into typical. The reverse can also be said, where we see the storyline start to tip toe into far more darker material, but then it comes right back to the middle ground. Sadly, the film gets stuck in mediocrity too many times. There are four characters in "Cop Out" that should have been perfect. Sadly only 2 of them get any where close to good. Top honors actually go to Kevin Pollak and Adam Brody who play rival detectives to Bruce Willis and Tracy Morgan's characters. Pollak plays Hunsaker and Brody plays Barry Mangold and the two of them have some of the best exchanges within the 107 minute film. I honestly wanted a whole lot more of them on screen. You know something is off with a movie when you want the schmuck cops to have more screen time than the main characters. Not lying here, I'd like a movie with Hunsaker and Mangold as the main characters. As for Bruce Willis and Tracy Morgan, chalk their performances up as missed opportunities. Willis is dry throughout and Morgan becomes grating multiple times. We've seen Bruce Willis do funny before, but here he essentially feels like he is going through the motions. You can tell Willis and Morgan had a good time filming together, but that chemistry does not equal memorable performances in the least. When you think back on all the great Bruce Willis performances over the decades (even the cheesy one's), "Cop Out" will not be one you think of quickly. Morgan on the other hand felt like he needed his leash reigned in. He had one too many ad-libbing sequences, most of which, do not even conjure up a chuckle. Tracy Morgan was a bitter disappointment and being a big fan of his, it is hard to say how badly I wanted someone else to be in the role of Paul Hodges. "Cop Out" almost feels like director Kevin Smith thought nothing could go wrong. I mean he had a Bruce Willis in the lead role and a highly sought after Black List script, all the chips were on his side. I hate to think Lunchbox just sat back and let this one happen, but couldn't he see in the dailies what was happening? The film needed just a little push in the right direction and it could have been so much more. Finally, Smith does deserve some credit for going out and getting legendary composer Harold Faltermeyer. Faltermeyer of course created the epic synthesized scores to all the Beverly Hills Cop movies, The Running Man, Fletch, Tango & Cash, Top Gun and last but certainly not least the original Alvin and the Chipmunks animated series theme song! His work on "Cop Out" is a perfect piece of nostalgia that really helped to elevate a cop comedy stuck in the muck.